Eva Peron, known more affectionately as Evita, is a global historical and cultural icon. Over the course of her short life she became loved by the masses and was a champion of women’s and workers’ rights. 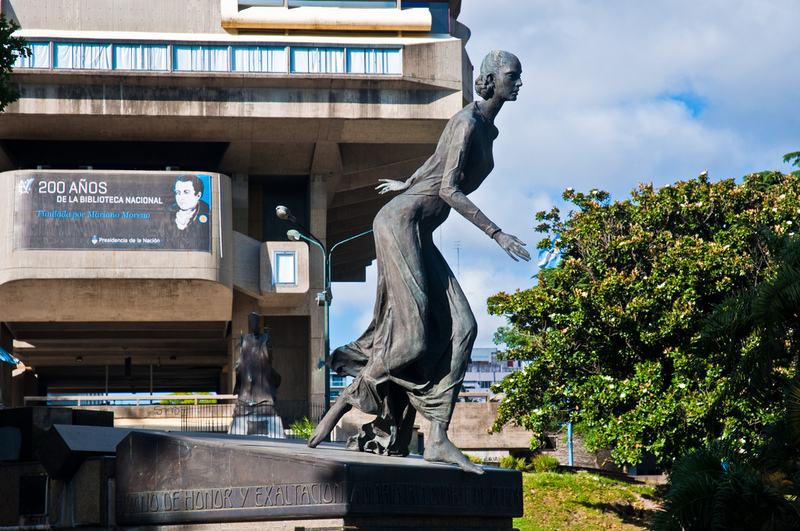 Follow in her footsteps by taking yourself on an Eva Peron tour of Buenos Aires. On the site of what is now the Biblioteca Nacional, or the national library, in the Recoleta neighborhood of Buenos Aires used to sit the former presidential palace of President Juan Peron and the first lady, Eva Peron. The palace, known as Unzué Palace, became something of lore following the military coup that ousted Peron from power in 1955, after which they ordered the complete demolition of the house, which, together with its grounds, took up more than three city blocks. This was where Evita lived out her last days in a battle with cancer, and where she eventually died in 1952. The house would have fronted onto Libertador Avenue, where there is now a large monument dedicated to Evita. This was where the young Evita, who had moved from the country to Buenos Aires to become an actress, met Juan Peron in 1944 at a gala to raise money for the victims of an earthquake in San Juan. The stadium is now a popular concert and events venue, and is situated close to the Kirchner Cultural Center, inaugurated by ex-president Cristina Kirchner, who some consider to be akin to a modern-day Evita. 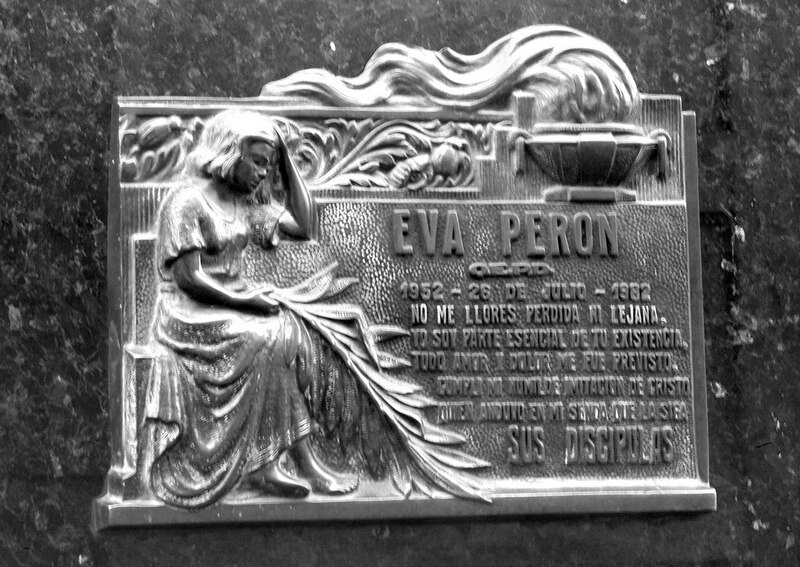 Buenos Aires’ most famous graveyard is the final resting place of Eva Peron. Although, this wasn’t always the case. The story of Eva Peron’s body is a harrowing one, and one that remained a mystery for almost 20 years. After her death from cervical cancer in 1952 aged 33, her body was transferred to the Ministry of Labor, outside which Argentines queued for two weeks to see her body, such was the grief felt by the populace. Her body was embalmed and, while they waited to construct a monument to her, her body stayed in her office for almost two years before the military overthrew Peron, at which point her body disappeared. For 16 years, the whereabouts of her remains were unknown, until in 1971 it was discovered that her body was in Milan. It was flown to Spain, where it sat in Juan Peron’s living room of the house he shared with his then-wife Isabel, until it was able to be brought back to Buenos Aires, where it now lies 16 feet underground in the Duarte family crypt in the Recoleta Cemetery. The crypt is heavily fortified to prevent anyone from trying to steal it again. The Casa Rosada, or the Pink House, is Argentina’s current presidential palace and is famous, among other things, for its iconic balcony which overlooks Buenos Aires’ main square, the Plaza de Mayo, where people congregate to march, protest, or, in Eva Peron’s time, hear the first lady and national hero give speeches to her loyal devotees, or descamisados, meaning “the shirtless ones” because of their poverty. It was from this balcony that Evita gave her final speech in October 17, 1951, a day which is now marked as Loyalty to Peron day. This was also the where the scene from the movie Evita was filmed, where Eva Peron, played by Madonna, sang the famous song Don’t Cry For Me Argentina from this balcony. 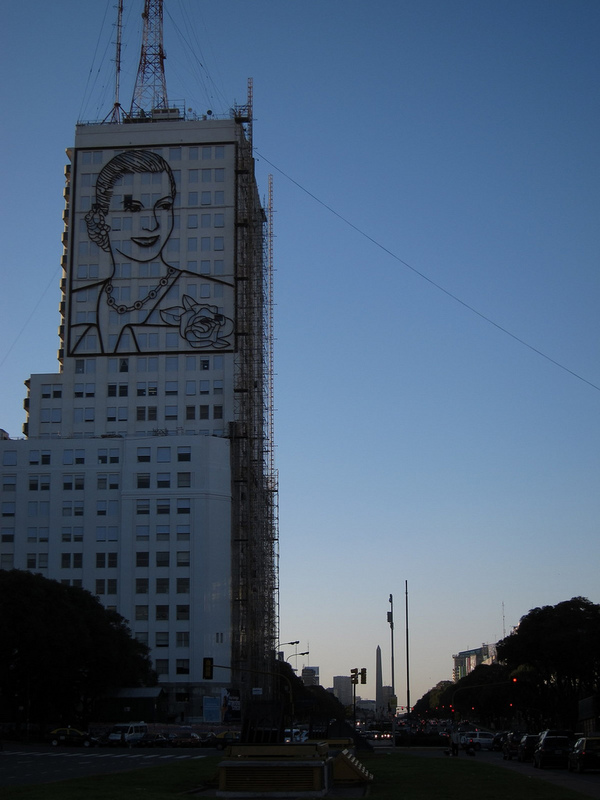 This white tower block in the middle of 9 de Julio Avenue, one of the main thoroughfares in the city and the widest street in South America, bears two steel portraits of Evita on the north and south faces. One depicts her giving an impassioned speech into a microphone and the other is of her official portrait. They were installed on the 59th anniversary of Evita’s death in 2011, and are by sculptor Alejandro Marmo. This upscale building in Recoleta was where Eva and Juan Peron lived for a time before Peron was elected president in 1946. They lived together in an apartment on the fourth floor when this neighborhood was the most glitzy and glamorous in the city. Now a luxury hotel, the reception and halls are decked out with Evita memorabilia. It is well worth a visit just to see the opulence of the building itself. Opened in 2002, the Evita Peron Museum is a must-see on any visit to Buenos Aires. Situated in a beautiful mansion that draws on Renaissance architecture for its style, the building itself was actually inaugurated as a shelter for homeless women and children by Evita in 1948, which makes it all the more fitting that her own museum should be located here. The museum holds a wealth of paraphernalia and memorabilia about Evita, and even has some of her possessions, including some of her clothes. Dine on the patio for the real Buenos Aires experience.